Every major news organization in the country covered Wednesday’s tea parties. And, in doing so, they all ignored the fact that residents of Washington, D.C., are subject to the very conditions that led to the Boston Tea Party. It’s not like this is some big secret. 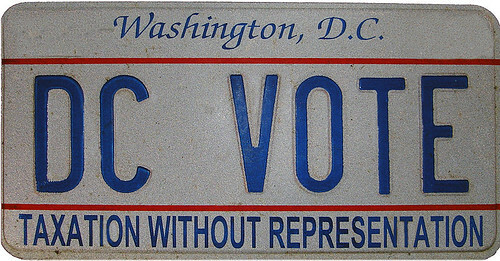 On their way to work on Wednesday, reporters who are based in Washington would have passed countless cars bearing license plates that offer the reminder “Taxation Without Representation.” Many of them probably have such a license plate on their own car. Then they went out and covered tea-party tax protests in which people who have representation complained about “taxation without representation” — and it didn’t occur to them to mention the situation in Washington, D.C. If any reporter asked any tea-party participant or advocate if they support giving the District of Columbia a member of Congress and two senators, I can’t find evidence of it. Even The Washington (D.C.) Post didn’t mention the surreal situation in which right-wing activists, who no doubt favor taxation without representation for D.C. residents, held a rally in the District of Columbia that they claimed to model after the Boston Tea Party protest against taxation without representation. This entry was posted in Conservatives, Taxes, Voting. Bookmark the permalink. Don’t forget American Samoa, Northern Mariana Islands, Guam, Puerto Rico and the U.S. Virgin Islands. Puerto Rico alone has 4 million residents, far more than D.C.
Let me see if I understand correctly: Because the protesters did not address a marginally related question that no one asked them, they are hypocrites. Not quite standard logic, but I can take that as his position. That being the case, I have to ask: If Mr. Foser believes so strongly in this cause, where are his columns advocating amending the Constitution to allow D.C. to have Congressional representation? Are they missing because he cares more about scoring cheap political points than having D.C. residents represented? Obviously these teabaggers are dumbfuck nutters who have no idea what they are rallying for, other than that it involves TAXES!!!11!!ZOMFG!11!!1! But my guess is that if you said to them, “Do you know that DC residents pay taxes but have no voting representation in Congress?”, they would agree that this is wrong. Puerto Rico? SRSLY? They don’t pay federal taxes, so the “taxation without representation” doesn’t apply there. DC voting representation is manifestly unconstitutional without it being a state. And it being a state would defeat the entire constitutional purpose of a separate federal district for national governance. Nonetheless, there’s two obvious solutions Tea Party goers would certainly support. DC voting rights could constitutionally be achieved by retrocession of all but the national mall to Virginia or Maryland, making its residents into citizens of one of those states. Or you could beat the “taxation without representation” problem by making the District a tax-free zone. But good luck getting congress to do that. In short, it’s entirely irrelevant because good solutions already exist. They have not happened because congress would prefer an unconstitutional gerrymander of epic proportions in support of the current majority party. DC residents have not gotten the vote because a) they are more black than the rest of the country b) they are more DemocratIC than the rest of the country and c) there has not been a DemocratIC president and a DemocratIC House and a DemocratIC Senate for long enough to even get halfway though fixing up the total mess that the Republican morons typically leave behind to get on with issues such as advancing democracy in our own land. I’m hoping things will be different this time around. having grown up in the DC area there have been all sorts of proposals, including splitting off a small portion of DC, and turning the rest into a state. But saying its unconstitutional isn’t an argument: we can amend the constitution. As to the original purpose of denying DC residents the vote, in the age of the automobile it doesn’t apply: a DC lobbyist gets no representation, but one that lives in VA or MD does. Misses the point, I think. I could be wrong, but from what I recollect, Guam and Saipan – like Puerto Rico – don’t pay federal income tax, either. According to Matthew Yglesias, all that would be required for statehood is a majority vote in both houses, and some fancy footwork on federal buildings. I have no idea if that’s correct but just imagine the reaction if we tried! My guess is the teabaggers would need mass CPR. The Constitution says “people OF the several states”, not people “residing in” the several states. Even Americans who have lived abroad for decades and have no intention of returning are allowed to vote, in the state in which they last resided. DC, a part of the original thirteen colonies, is part and parcel, progeny and Posterity of the Founders who pledged their Lives, their Fortunes, and their Sacred Honor to secure Liberty. DC residents are not people of the African deserts, nor of the Argentinian pampas, nor of the Artic tundra, nor of the Asian steppes. They are “of” the several states. They have an inalienable (innate, inherent, intrinsic) right, as full members belonging to this nation, to participate in the making of the laws under which we all must live. Government Without Consent, “in all cases whatosoever”, is Illegitimate Tyranny, a raw and corrupt exercise of unwarranted Absolute Power, “because we can”. Seriously, how can you take this seriously? Or does that answer itself?